This is turning out to be a very low water year along the Klamath River; the lowest I have seen in a very long time; and we still have several months in front of us before the season is over. The water has dropped by at least a foot since we did our first weekend group outing of the season several weeks ago. 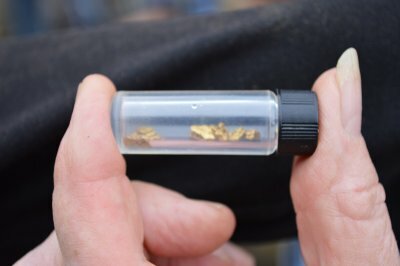 You guys might recall from last month’s newsletter that we have discovered a massive surface gold deposit on our K-23AA property which is located around 7 miles downstream of Happy Camp. 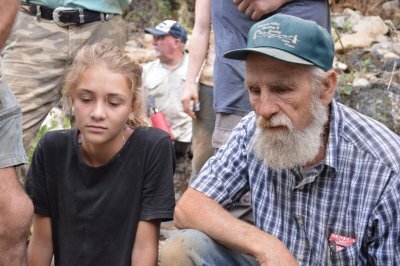 Since the discovery is a pretty long walk from the nearest easy place to gain access to a boat, a walk that many people might want to make in hundred-degree weather, our biggest challenge this season has been in coming up with creative ways to move large numbers of people to and from the rich gold deposit by boat. 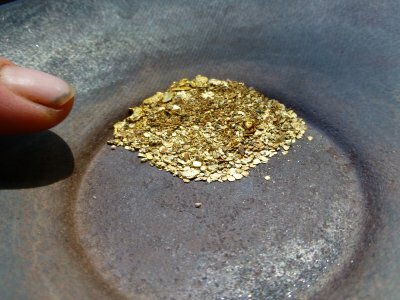 Typical pan sample out of the new deposit! We worked out a pretty effective method several weeks ago by towing one of our larger Colorado River rafts behind my jet boat. We were able to transfer around 20 people at a time. That worked out well. Surprisingly, it was not the movement of people that was difficult. The hard part was towing the empty raft back up through two sets of pretty gnarly rapids so that we could pick up another load of people. All in all, with 120 people, this meant towing the raft up through two sets of rapids 24 times during the first project. My jet boat was getting so tired, there were a few trips towards the end where I had my doubts we would make it! As it was, the first project of the season went really well. 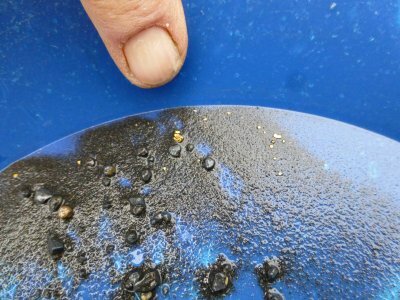 This new deposit appears to be the richest and largest surface gold deposit (out of the water) we have ever located. 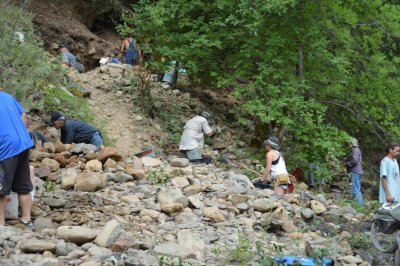 We recovered 18 pennyweights (9/10ths of an ounce) of beautiful gold in several hours of digging on the first project of the season, which is at least a 5-year record. The first thing I did after the first project was finished was tow my tired jet boat over to the shop for a full tune-up. Because it is the mechanic’s busiest time of the year, I did not get the boat returned to me until the Friday morning before the start of the second project (last weekend). By then, John Rose was telling me that the river had already dropped too low, and the rapids were too steep, for us to use boats to move people. Oh my! This is only the second time in 30 years that we have found rich, virgin stream bed out of the water! This gold deposit is too rich to abandon! 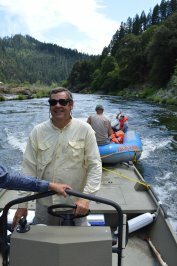 Very fortunately for the Club, we have a new member this year, Dan Baker, who brought along the strongest and nicest jet boat I have ever seen for maneuvering the Klamath River in low water. Dan also brings along other valuable attributes, like being able to capture images and video, and do an excellent job of editing. You will see a bunch of his good work being put up on our new Facebook page. All or most of the images and video in this newsletter were produced by Dan and our new office manager, Tony. 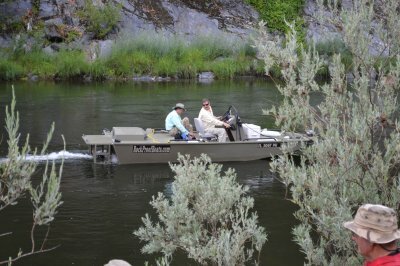 In any event, while most of our other project helpers were of the opinion that we were going to need to walk people in for the weekend project, Dan was telling me that his jet boat was easily making it up and down through the section of Klamath River where the project was going to take place. The weatherman said it was going to be 100+ degrees on Saturday afternoon. So Dan and I, with some of our helpers, were out on the river Friday afternoon, using two jet boats and our large rubber raft working out how we could move people around on the river. The interesting thing about the Klamath is that when the water drops, the rapids get steeper, shallower and faster, and the waves get taller. So while the slower sections of river get easier to traverse, the faster sections get more difficult as the water drops. 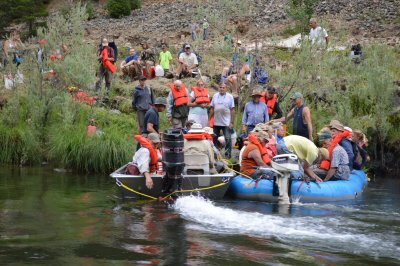 Fortunately, and to my great relief, we discovered on the first trial run that we were going to be able to use my jet boat, once again towing the large raft, to move people to and from the worksite, just like we did during the earlier project. The ride through the rapids was going to be faster with more splashes; but members were going to be alright with that in the hot weather. The big challenge was how we were going to move the raft back up through the rapids. 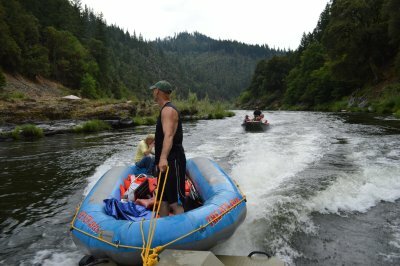 Since his jet boat is stronger than mine, Dan offered to tow the raft upriver. So there we were on the first try with several of us in Dan’s boat and Derek Eimer riding along in the rear of the raft. Dan’s boat had plenty of power to do the job; and it initially looked as though the raft would go along with no problems. But about half way through, a very large stationary wave in the rapids came over the front of the raft and caused the front end to dive just like a submarine. It all happened in a split second. Derek was lucky he was not washed right out of the rubber raft! These kinds of problems are best worked out in advance of having 100+ members out along a remote section of the river where the only way back to the cars is either by boat or swimming! 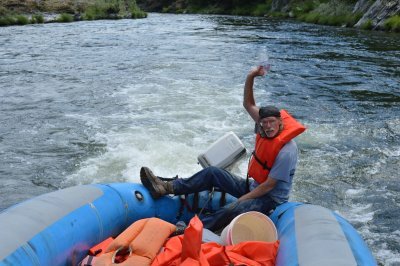 For our third attempt, Rich Krimm came up with the idea of rigging a tow harness from further to the rear of the raft and running it underneath to the front so that the pulling would help lift the front of the raft higher above the water. We had some extra rope in my jet boat and made quick work out of rigging the harness. And while the front of the raft appeared to be further above the water, that stationary wave in the rapids overwhelmed the raft just like during our earlier attempts. By now, Derek was looking half drowned. But he was still laughing and enjoying the adventure. One of the many reasons I love managing The New 49’ers is that I am able to get out with other very capable guys (and gals) and confront some of Mother Nature’s most difficult challenges, and usually, but not always, find a way to overcome them. We were all having a blast out there! Even though we were having fun, not a single one of us ever let our guards down to the dangers involved. 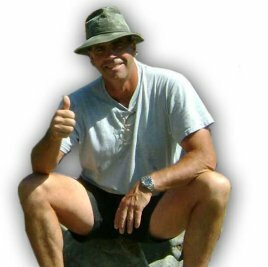 The Klamath River is so powerful; it can snuff the life out of a person in just moments. When things go wrong in a boat on the river, they go critically wrong; and rather than worrying about saving the boat, the emergency can immediately turn into trying to live through the experience. The more extreme the conditions, the less margin there is for error; and the worse things are going to turn out if we make a mistake. Believe me; I have experienced a whole lifetime of making mistakes! After submarining the raft three times, we came up with a whole new idea of tying a harness further forward on Dan’s jet boat, pulling the front of the raft right up onto the backside of the jet boat and securing it so it would piggyback up through the set of rapids. This plan worked out great, except that the powerful blast out of Dan’s jet boat made for an interesting and challenging ride for Derek. Several times, it looked like the raft would completely flip over! Ultimately, we worked out a system where Derek and Dyton Gilliland would shift their weight one way or the other to compensate for which side of the jet blast the raft was riding on. Here is some great video showing how we finally worked out a technique to move the raft upstream. 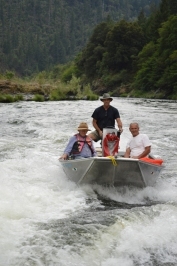 We did several trial runs up through the rapids just to make sure we could rely on the technique once we had a bunch of New 49’ers to move around on the river. The technique worked great, and we were all set for another weekend project on the river. Cool! By Saturday morning, we had 130+ people signed up for the weekend project. This was an all-time high for the second project of a season. Always in the past, we have a large group on the first project, once as many as 137 people. Then the numbers drop off dramatically as we progress through the season. But not this year! This turned out to be an enthusiastic bunch of New 49’er members who were out to have fun and get some gold! After going over some theory on Saturday morning, and a break for lunch, our large group arrived down on K-23AA at around 1 pm. This is when the heat of the day really sets in. Someone measured the temperature at 109 in the shade, and 123 out on the rocks in the direct sun. That’s hot! 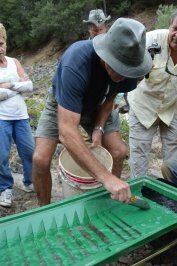 Fortunately, since we have already located the pay-dirt in this massive gold deposit, Saturday’s objective for this season’s projects is mainly to teach beginners how to operate a gold pan. 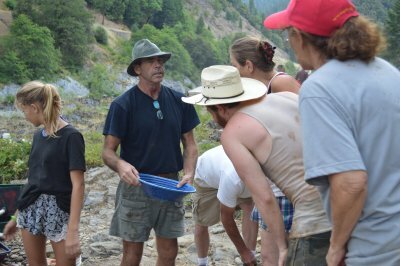 We take this part very seriously, because panning is the beginning of the prospecting learning curve. 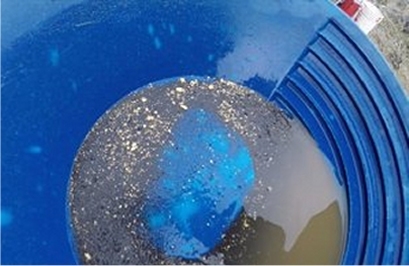 You cannot sample for high-grade gold deposits unless you can effectively work a gold pan. All of our project helpers were waiting for us when we started arriving by boat with 20 people at a time. 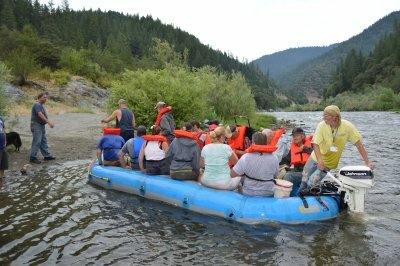 Using our new method of moving the raft upriver, it only took us around 30 minutes to get everyone to the worksite. It went just like clockwork. By the time Dan and I tied off our jet boats, nearly everyone was already panning up a storm. Participants get to keep all the gold they can find on Saturday afternoon. So this bunch was really going at it! Here is some video that captured a lot of the action. Going for the gold on Saturday afternoon! Boy was it hot out there on this Saturday afternoon! Once people started collecting under the shades we have set up out there, I took it as a sign that it was time to start ferrying people downstream to where they had parked their cars earlier in the day. With some excellent teamwork, it took 5 boatloads to get everybody back across the river through another set of rapids about a half-mile downriver. 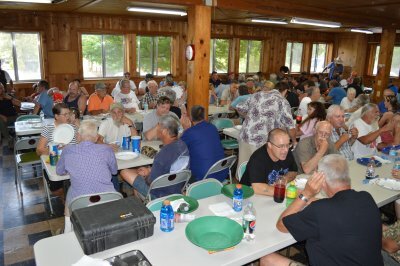 Saturday potluck was a full house; I’m guessing about 180 people. There was lots of food, and I could barely hear myself think over the enthusiastic chatter of the very large group. This type of noise is always music to my ears! Some of our members just live for our Saturday night potlucks! Because Sunday is the day we work hard, we always get out there early. This is so we can get the work finished and be off the gravel bar before the heat of the day sets in. When I arrived at 6:15 am, there was already a long line of participants putting on life jackets to board the boats. Once again, it only took our experienced crew around 30 minutes to get everyone on the worksite. Everyone working together to get the gold! Taking top cuts to increase production. 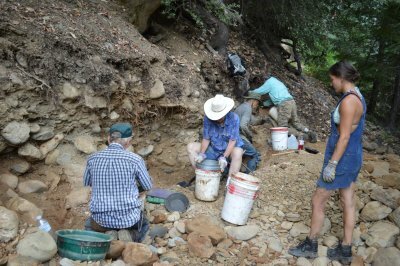 Several participants were vacking gold out of the bedrock traps as we uncovered them. 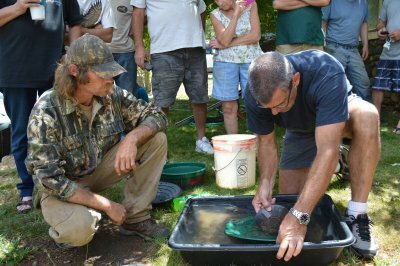 Craig Colt, who has been helping on these projects for many years, devoted most of Sunday panning samples of the material people were digging. The purpose of this is to identify the richer-paying areas and direct the digging program into more productive pay-dirt. 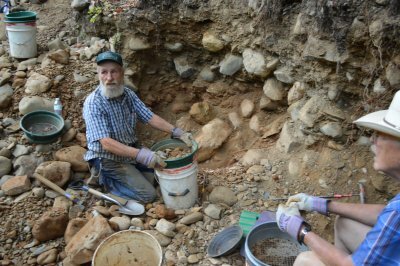 As we have worked forward in this deposit, we have discovered that there is an ancient, orange-colored streambed material that is paying the best. 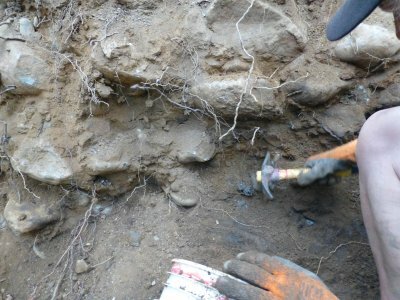 The good thing is that the material in most of this deposit is usually 2 feet or less to reach bedrock. 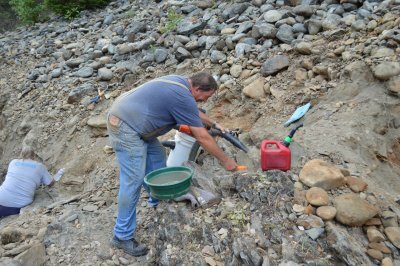 Bedrock is where we expect to find gold nuggets! This is one pan sample off the bedrock at Ground Zero! Here we are at ground zero! We were getting nuggets out there, too! Showing off the gold always motivates participants in these projects to redouble their efforts, and this time was no exception! 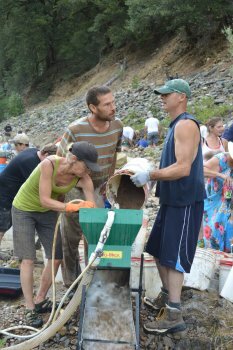 So I was met with some disappointment about an hour later when I went around and told everyone to finish up the final buckets and start reclaiming our excavation back to the normal contour of the bank. Some just kept on digging, anyway. There were at least 15 full buckets of rich pay-dirt delivered to the high-bankers even after we had shut them down to do final clean-up! In hindsight, if we had processed those, we likely would have met my target of recovering a full ounce of gold. Running the day’s concentrates over the Le Trap Sluice. Ferrying everyone down through another set of rapids to the boat landing where their cars were parked just added more fun and excitement to an already excellent day. Dave and Craig Colt demonstrating the final clean-up steps. 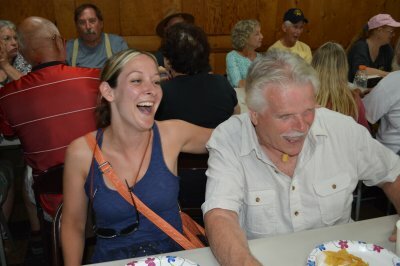 We all met up at the Grange Hall a few hours later to complete the final clean-up process and split the gold. 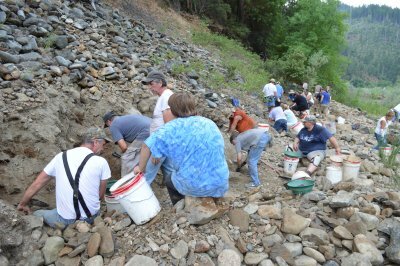 In all, we recovered 18.6 pennyweights, which included 27 nice gold nuggets. 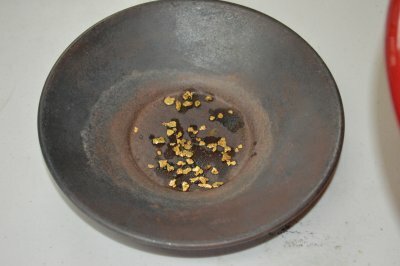 Everyone who participated received an equal share of the gold by weight. 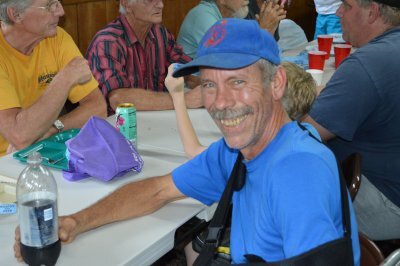 There were a lot of happy faces as we handed the shares out. 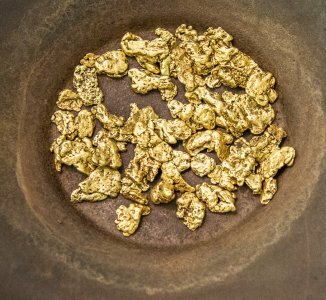 For many, it was the first gold they had ever mined. Truthfully, before we weighed the gold, it looked to me like it was at least a full ounce. That’s what I was hoping for. But we didn’t quite make it. We will just have to take another shot at it on the next project! 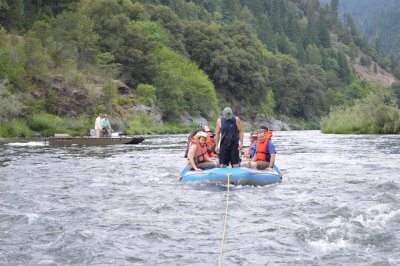 By the way, you guys don’t have to wait for the monthly newsletter to see the adventures we are enjoying on the Klamath River. Our new video team is posting great material on the New 49’er Facebook page nearly every day. Just as one example here is the whole project adventure video which our guys put up on Facebook just a day or so afterwards. Remaining Schedule of 2015 Events: July 18 & 19; August 8 & 9; and August 29 & 30. Montine in our office (530 493-2062) is making contact with all the winners. I want to thank Garrett Metal Detectors for their generous support of our efforts to preserve the industry. When you are considering what kind of equipment to buy for your prospecting activities, I sincerely request that you take a strong look at the products being offered by the industry manufacturers who are supporting all of our combined efforts. I also need to personally thank all of you who participated in this fund-raiser. We could not play our part to help defend the small-scale mining industry if it were not for your ongoing support. Any legal contributions which have arrived in our office after this drawing will automatically generate tickets for the next New 49’ers Legal Fund drawing. 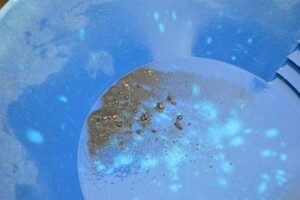 The new drawing will be for two ounces of beautiful gold nuggets (image above). Those will be split into a 1-once grand prize and four quarter-ounce prizes. There will also be 10 tenth-ounce American Gold Eagles and 10 American Silver Eagles. That’s 25 prizes worth winning! Our office will automatically generate a ticket in your name for every $10 legal contribution we receive ($100 will generate 10 tickets). There is no limit to the size or frequency of your contributions, or to the number of prizes you can win. Look for our new Paypal contribution link here. Your legal contributions can also be arranged by calling (530) 493-2012 or by mailing to The New 49’ers Legal Fund, P.O. Box 47, Happy Camp, CA 96039. Here is the bad news: I’m disappointed to announce that our motion in San Bernardino Superior Court for a Temporary Restraining Order (TRO) to allow suction dredging on our extensive New 49’er properties in conformance with the 2012 regulations was denied by the judge on the 9th of July. 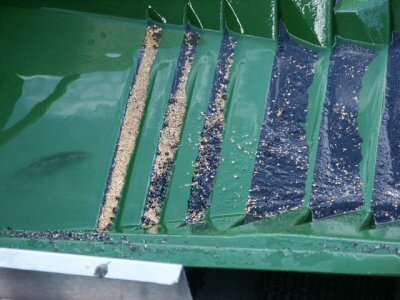 I believe this was likely our final opportunity to obtain hassle-free suction dredging in California during the 2015 season. By “hassle-free,” I mean that we continue to believe California’s moratorium is not legal; and that suction dredgers are not likely to be prosecuted, even if they are written a criminal citation. But suction dredgers do have the risk of their equipment being confiscated until some later time. So you dredge at your own risk for the time being. We will now switch gears into appealing San Bernardino’s recent Rulings to deny any meaningful relief to suction dredgers even after the court has Ruled and Ordered that the moratorium is unconstitutional — which State authorities continue to enforce. There is also the landmark Rinehart Decision which is being reviewed by the California Supreme Court. It is not an unreasonable expectation that we can have these matters resolved in time for our 2016 season. All I can say is that we have done our very best to bring about a hassle-free 2015 dredging season. I thank everyone who has supported our efforts. All we can do is keep trying. 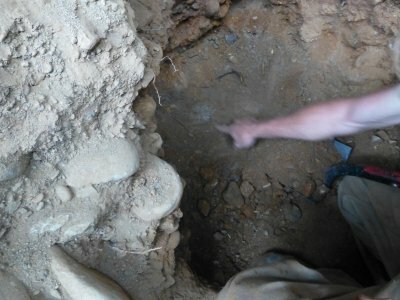 Now here is the good news: Just as I am finishing this newsletter, some of our most experienced underwater miners are finishing up a prototype for an entirely new concept in underwater mining with the use of a pressure washer primarily uses a powerful blast of very low-volume water to uncover and free rocks that must be moved out of the way in a submerged streambed. We believe the process may be nearly as effective as suction mining, but without the discharges which anti-mining activists complain so much about. We will be testing and developing the new idea over the coming weeks. Please watch for updates and news on our Facebook page and in next month’s newsletter.